Avoid the most common mistakes, take all the shortcuts and grow your business FASTER by following these step-by-step checklists! I'm a checklist junkie. I make checklists, download checklists, buy checklists and USE checklists to make my life easier. They just WORK. I love anything that simplifies a project and breaks it down into actionable tasks! So when I downloaded these 3 sets of Internet Marketing checklists, I thought that's exactly what they were - or all they would be, I should say. These are NOT just checklists. The email marketing "checklist" alone is 125 pages. These are practically detailed step-by-step training guides! Each one is done in actionable steps (ie checklists) - with tons of live examples, brilliant thought prompts & great information you can USE. 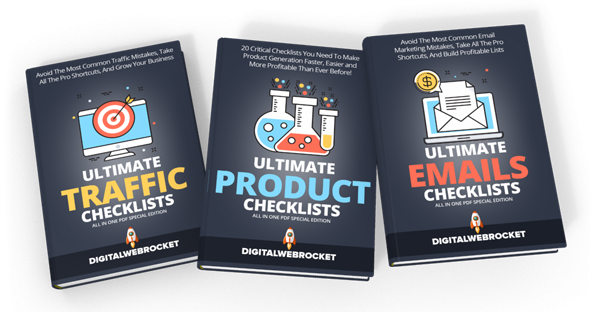 There are 20 Website Traffic Checklists, 20 Product Creation Checklists and 20 Email Marketing Checklists for a total of 60 Checklists in the Ultimate Checklist Bundle. I was originally just going to get the Product Creation Checklist package but it's 19.95 by itself, and you can get all 3 checklist sets for just $27. I'm working on my list building strategy right now too, so it was just a WAY better deal. I figured the traffic checklists would just be kind of "a fun bonus read" for me. I love seeing other people's creative ways for getting quality traffic. I did NOT expect it to be so full of awesome tips! As just a few examples from the Website Traffic Checklist set, topics include: how to stir up a sense of urgency, sealing up sales page leaks, choosing and positioning the RIGHT call-to-action, etc. I could go on and on, but this was a GREAT read. One I think anyone with a website should be reading, and checking off EVERY point! As with any product, I put this one through my own personal filter: Is this a good investment? Meaning: can I easily make my money back USING this product, or what I learn & implement from this product? The answer: YES! The ideas & prompts alone in the Product Creation checklist set are something I can put in place for immediate results. Things like "effective trigger words" and "clever product titles" (love!) and the 6 point email follow-up system on page 83 is simple yet brilliant - something I can set up TODAY. 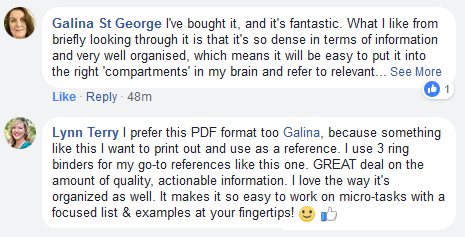 Don't just download them, open them up and get straight to the part you need to be working on NOW. I'm pretty sure you'll be amazed at how many ideas these "checklists" give you. They are more like step-by-step action lists, idea prompts & training guides. I was expecting simple checklists only, that I could use to double check what I'm working on as I go. I had NO idea these were going to be so detailed - and so full of training, strategy and brilliant ideas. All in small actionable bites, making them EASY to implement! Download them, use them... and get better results!